The Province of Barletta-Andria-Trani (Italian: Provincia di Barletta-Andria-Trani) is a province in the Apulia region of Southern Italy. The capital is shared by three cities: Barletta, Andria and Trani. The province borders the Adriatic Sea. It was created from 10 municipalities (comuni), which were formerly in the provinces of Bari (7 municipalities) and Foggia (3 municipalities), taking its name from the three cities which share the new administrative functions of the province. The province of Barletta-Andria-Trani is in the central part of Apulia and has an area of 1,542.95 km2 (596 sq mi). The province borders to the northwest by the province of Foggia, to the north and northeast by the Adriatic Sea, to the east with the Metropolitan City of Bari, to the south by province of Potenza (Basilicata region). The main river of the province, and of the Apulia region, is the Ofanto river, that flows into the Adriatic Sea between Margherita di Savoia and Barletta. The highest point in the province is Monte Caccia, 679 m (2,228 ft) high; it is in the Altopiano delle Murge, a karstic plateau of rectangular shape in southern Italy. As of 31 December 2015[update], there are 393,534 persons (194402 males and 199,132 females) living in the province, for a population density of 255.1 inhabitants/km². The province has 10 comuni. ↑ "Il Presidente della Provincia di Barletta-Andria-Trani" (in Italian). Provincia di Barletta-Andria-Trani. Retrieved 2 August 2016. ↑ 2.0 2.1 "Provincia di Barletta-Andria-Trani" (in Italian). Tuttitalia.it. Retrieved 2 August 2016. ↑ 3.0 3.1 3.2 "Statistiche demografiche ISTAT" (in Italian). Demo.istat.it. Retrieved 2 August 2016. ↑ "Comuni in provincia BT per popolazione" (in Italian). Tuttitalia.it. Retrieved 2 August 2016. 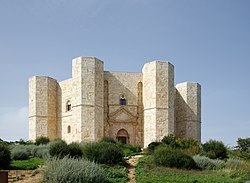 Wikimedia Commons has media related to Province of Barletta-Andria-Trani. This page was last changed on 1 June 2017, at 14:02.